The Oceanside Police Department is hosting a blood drive in honor of Officer Brad Hunter, who was intentionally hit by a driver while conducting a traffic stop. OCEANSIDE (NEWS 8) - The Oceanside Police Department is hosting a blood drive in honor of Officer Brad Hunter, who was intentionally hit by a driver while conducting a traffic stop. Hunter and his wife have asked the community to come together to help other trauma patients. Donors can stop by department headquarters Friday from 9 a.m. to 6 p.m.
Donors must be at least 17 years of age (16 year olds can donate with parental consent), 114 pounds or more and in general good health. Due to the popularity of this drive, donors are strongly encouraged to schedule an appointment to avoid long wait times. To schedule an appointment, please call 619-469-7322 or visit www.sandiegobloodbank.org. 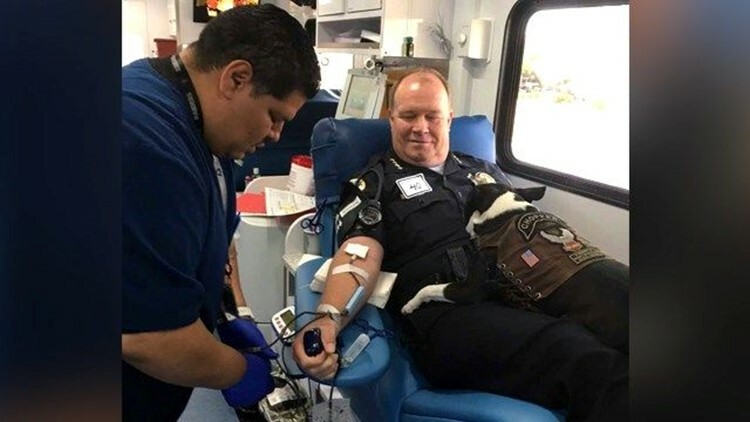 Oceanside Police Chief Frank McCoy giving blood in honor of Officer Brad Hunter with Chopper the Biker Dog.